Click here to read the Brunswick Real Estate News! Summer is winding down, but it's still plenty hot! Find some air conditioning and enjoy the August Brunswick Real Estate News. 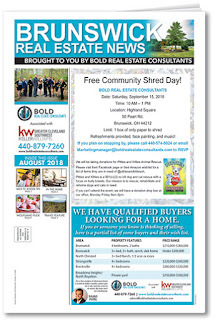 On the cover get details about the Free Community Shred Day!, sponsored by BOLD Real Estate Consultants. This fun community day is an opportunity you don't want to miss. Help keep your personal identity safe while supporting Pitties and Kitties Animal Rescue (donations will be taken on site). In addition, you'll also find some great travel and decorating articles, as well as a delicious recipe from Wolfgang Puck.